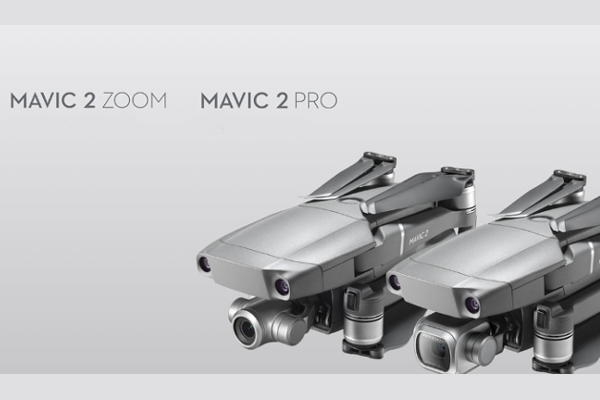 DJI intros Mavic 2 Pro (world's first drone with an integrated Hasselblad camera) and Mavic 2 Zoom (world's first foldable consumer drone with optical zoom). DJI today introduced two additions to its Mavic series: Mavic 2 Pro, the world's first drone with an integrated Hasselblad camera, and Mavic 2 Zoom, the world's first foldable consumer drone with optical zoom capability. Incorporating the iconic folding design of the Mavic Pro, the Mavic 2 is a powerful platform with new gimbal-stabilized cameras and advanced intelligent features like Hyperlapse and ActiveTrack for easier and more dynamic storytelling. With an impressive flight time of up to 31 minutes and a more stable video transmission system, Mavic 2 delivers the optimal flight experience for capturing epic shots. Powered by a 1/2.3-inch CMOS sensor, the Mavic 2 Zoom is DJI's first foldable consumer drone with zoom. With the Mavic 2 Zoom, you can get closer to your subject at a moment's notice by combining two-times optical zoom (24-48mm) with two-times digital zoom to simulate a 96mm telephoto lens that captures lossless video in full HD resolution. Hybrid auto-focus on the Mavic 2 Zoom combines phase and contrast detection for higher focus accuracy with an increased focus speed of up to 40% faster than before. Shoot vivid 12-megapixel photos or take advantage of the new Super Resolution feature that uses optical zoom to automatically capture and stitch nine photos together for a highly detailed 48-megapixel image, making it an ideal option for landscape photography. Free - pilots the drone manually while shooting a Hyperlapse video. Circle - automatically flies the drone in a circular pattern around a subject you select to create a timelapse video that captures the action. Course Lock - keeps the camera fixed on shooting subject while the drone flies in a straight direction to create a unique perspective. Waypoint - plans a complex flight path based on both altitude and GPS coordinates to capture complex shots. Keeping a moving subject in the frame is now easier than ever with ActiveTrack 2.0. This enhanced auto-track feature delivers a powerful combination of autonomous tracking and obstacle sensing capabilities never before seen in a DJI drone. Using the main camera and the front dual vision cameras, the Mavic 2 creates a three-dimensional map of the area in front of it, and uses new trajectory algorithms to analyze motion and predict the subject's path up to three seconds in the future. When tracking a target, the Mavic 2 can recognize and avoid obstacles while shooting your target without interruption. It can stay on target, even if your subject momentarily goes behind an obstacle, and can track the subject at higher speeds of up to 44 mph (72 km/h). The Mavic 2's redesigned, more aerodynamic airframe reduces body drag by up to 19% compared to the Mavic Pro, allowing the Mavic 2 to fly at speeds of up to 44 mph (72 km/h) in Sport mode. Combined with a more efficient, quieter propulsion system and noise reducing propellers, the Mavic 2 has a maximum flight time of up to 31 minutes. To ensure crisp photos and smooth, shake-free footage, the Mavic 2 houses an ultra-precise three-axis mechanical gimbal to stabilize its camera even during high-speed motion. Photos and videos can be saved directly to the drone using its 8 GB onboard storage. A redesigned remote controller features detachable control sticks for ease of storage and portability. The Mavic 2 is compatible with DJI Goggles with the gimbal control range up to -75°–– +75° in Head Tracking mode, offering users a more immersive FPV flight experience. The US retail price of a Mavic 2 Pro, including the drone, battery, remote controller, charger, and four pairs of propellers, is $1,449 USD. The US retail price of a Mavic 2 Zoom, including the drone, battery, charger, remote controller and four pairs of propellers, is $1,249 USD. A Fly More Kit, including two additional batteries, a multi-battery charging hub, a car charger, a battery to power bank adapter, two pairs of propellers and a carrying bag, retails at $319 USD. A gimbal replacement service exclusively for Mavic 2, will be available soon.